2. In a large bowl, toss the cauliflower florets with salt, pepper, 1/2 teaspoon cumin, and 3 tablespoons olive oil. Mix well. Place cauliflower on a baking sheet and roast for 25 to 30 minutes. 3. In a large skillet over medium heat, add the remaining 2 tablespoons olive oil. Add the onions and sauté until soft, about 5 to 8 minutes. Add the vinegar and let reduce until almost dry, about 4 to 5 minutes. Mix with roasted cauliflower. 4. In a small bowl, whisk together the yogurt, tahini, lemon juice, water, and remaining 1/2 teaspoon cumin. 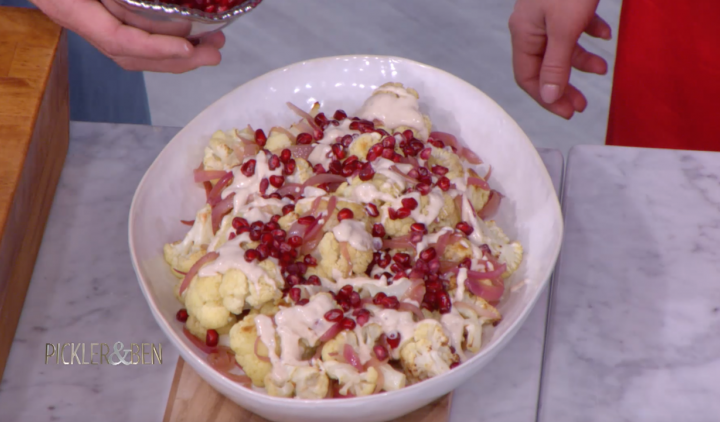 Drizzle sauce over the cauliflower and garnish with pomegranate seeds.